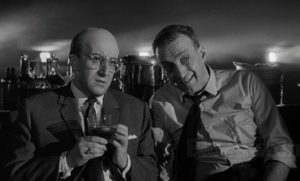 Dr. Strangelove or: How I Learned to Stop Worrying and Love the Bomb is a comedy from 1964 directed by Stanley Kubrick starring Peter Sellers, George C. Scott, Peter Sellers, Sterling Hayden, Slim Pickens, and Peter Sellers. The story follows the United States as the world faces a global crisis: a rogue general has ordered an air strike on Russia while the president and all his men gather in a war room to try and stop the catastrophe from happening. The stakes are raised even higher when it’s revealed the Russians have a doomsday machine that will activate and destroy the world in the event of an attack. It’s a nail-biting race against time to plan for a potential Armageddon. It’s also a genius and dastardly funny film in almost every scene. It’s also a genius and dastardly funny film in almost every scene. 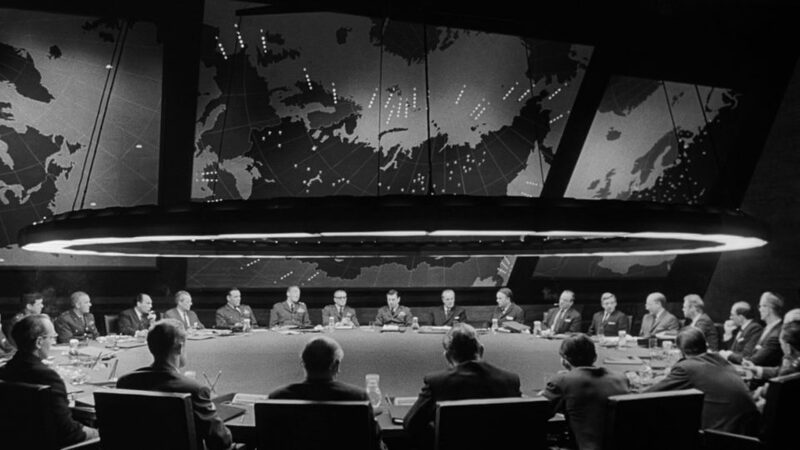 The first narrative centers on President Merkin Muffley (played by Peter Sellers), his cabinet members, and generals, including the Chair of the Joint Chiefs of Staff General Buck Turgidson (played by George C. Scott). 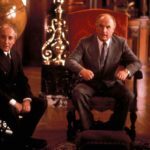 Muffley, a milquetoast administrator, slowly loses his grip while the situation gets even dier and panics as time passes. Turgidson is a bombastic gung-ho general, never quite grasping how deadly the situation is. 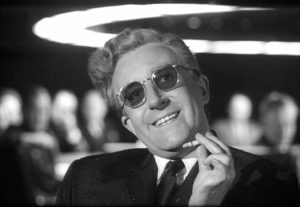 About halfway into the movie, the cabinet brings out the title character, Dr. Strangelove (also played by Sellers), an ex-Nazi scientist to consult on preparing for the Doomsday Machine. The quirks of this character include, but are not limited to, an outrageous German accent, a rogue right hand that often sieg heils out of nowhere, alongside totally crackpot ideas for when humanity that just might have to burrow underground. The second narrative is set on rogue Brigadier General Jack D. Ripper (played by Sterling Hayden), made totally paranoid by the Cold War, and has not only ordered a strike on Russia, but has turned US troops against each other on their own army base. It’s up to put-upon Group Captain Lionel Mandrake (also played by Sellers) to get the air strike cancel codes from Ripper and halt the catastrophe, and he gets a front row seat to Ripper’s insane rants about “denying his bodily essence” to the Russians and other crazy nonsense. The third narrative is set aboard a US bomber flying over Russia captained by Major “King” Kong (played by Slim Pickens). Pickens’ Kong is a straight-up cowboy, straight up to his last scene, a clip that most people have seen involving a yeehaw and a bomb. 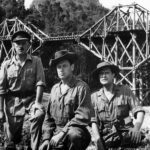 The movie is shot and played straight as a heart attack, like an old war film down to the use of black and white instead of colorful photography. When rogue Brigadier General Jack D. Ripper (played by Sterling Hayden) is monologuing to Group Captain Lionel Mandrake (played by Peter Sellers), the camera puts him in an imposing and dramatic angle. All while he’s talking about something completely absurd. The performances are fantastic in this movie. 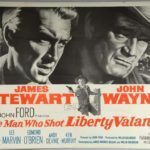 Sellers juggles three different characters excellently and brings three different types of humor for each role, and while Sellers gets most of the acting attention from this movie, his costars are often just as entertaining. Scott steps out of his comfort zone and is practically bouncing off the walls for his character, and Hayden is a perfect dose of really dark humor as you can’t help but laugh at his insane but deadpan rants. The writing is sharp at every corner regarding military culture, the uselessness of the political elite, and the mania of Cold War politics and the nuclear arms race. By the end, it feels as if the characters really deserve the ending they received in the negative perspective. And when the laughs wear off the sequence of events is jarring and uncomfortable. 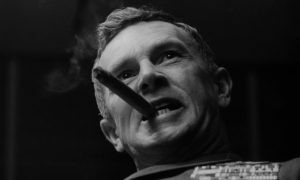 Dr. Strangelove is an unforgettable film, but may require more than a single watch to catch every meaningful moment. Fortunately, it’s well worth more than one viewing.